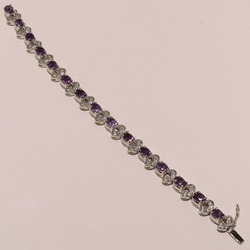 Our range of products include cut stone bracelets, cluster gemstone bracelet and rodium cutstone bracelet. 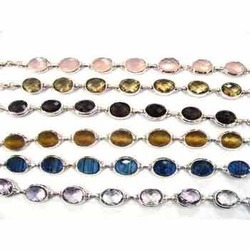 We are a renowned manufacturer of Cut Stone Bracelets that are highly demanded and admired amongst the customers for their attractive looks and authenticity. Cut Stone Bracelets are in line with the latest fashion trends and enhance the beauty of the wearer to a great extent. We assure timely delivery of aesthetic Cut Stone Bracelets. Moreover, we offer them at very reasonable prices through easy modes of payment. 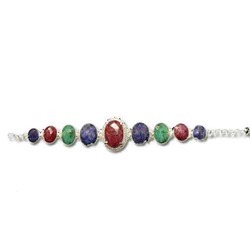 We are an esteemed manufacturer of Cluster Gemstone Bracelet that is available in beautiful combinations of colors. Being fabricated using high grade materials, Cluster Bracelets are lustrous and long lasting. Moreover, Cluster Bracelets are stylish and fashionable. Cluster Bracelets are available in varied sizes to meet the diverse demands of customers. We assure timely delivery of Cluster Bracelets.